HomeWho Was New Castle’s Oldest Resident in 1925? Who Was New Castle’s Oldest Resident in 1925? 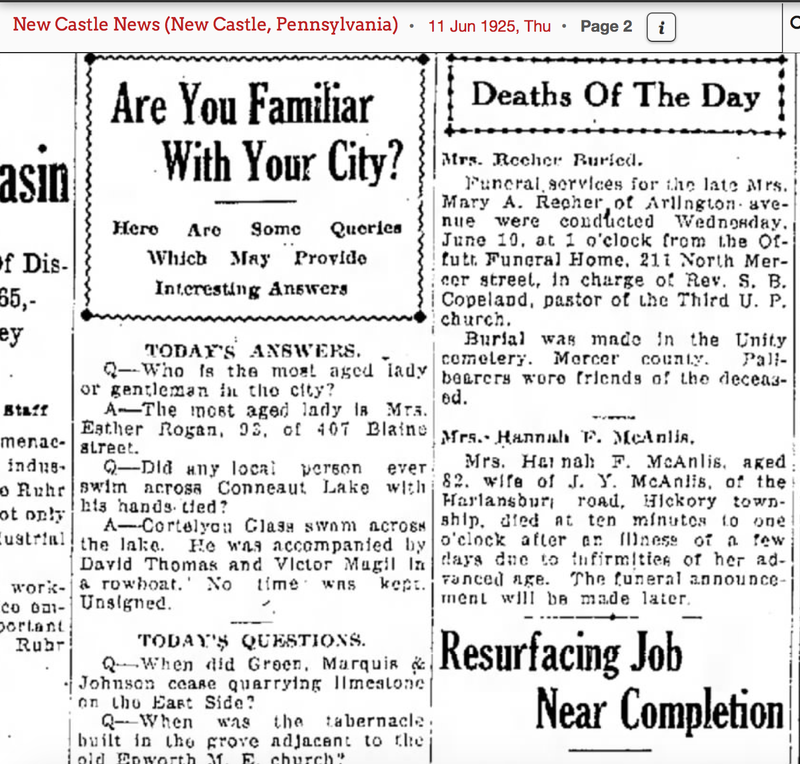 Just who was New Castle, Pennsylvania’s oldest resident in 1925? It was none other than my 3rd great grandmother Esther Callahan Rogan. Grandma Rogan was born in Liverpool, England on April 23, 1832 and arrived in the United States in 1851. After living in New York and briefly in Ontario, she was living in New Castle by 1870 with her husband James and children. Many of her later birthdays, including her 84th and 90th, were featured in the New Castle News. The blurb below, written as an answer to a newspaper trivia question, tells us that 93 year old Esther Rogan of 467 Blaine Street is the ‘most aged’ lady or gentleman in the city. Grandma Esther died in New Castle February 19, 1927 at the age of 94. “Are You Familiar With Your City?”, New Castle [PA] News, 11 Jun 1925, page 2, col 5; online index and digital image, Newspapers.com (http://www.newspapers.com : accessed 6 Jan 2016), Newspaper Archives, 1700s-2000s.